About this object Speaker of the House Sam Rayburn opened the joint meeting and welcomed his former colleague. On this date, Secretary of State Cordell Hull addressed a Joint Meeting becoming the first cabinet Member ever to address the Congress. Many hoped this occasion would improve open lines of communication between the President and Congress. The historic address followed Hull’s successful negotiations at the Moscow Conference, with the Soviet Union, Great Britain, and China. Criticized as idealistic, the new agreement set terms for what was hoped to be a sustaining postwar peace in Europe. In addition, it laid out plans to deal with Germany, Italy, Austria, and war crimes committed by the Nazi regime. Once a Representative and Senator from Tennessee, Hull was well-received by his former colleagues. 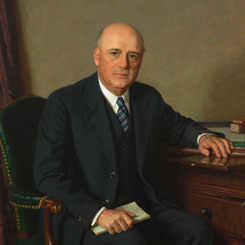 Speaker of the House, Sam Rayburn of Texas opened the Joint Meeting welcoming Secretary Hull and stating that the Moscow Conference’s peace plan, “interpreted the inarticulate longings of millions here and of millions over there who through fear today, cannot speak for themselves.” In the address, Hull reminded Congress that, “Only by carrying forward such a program with common determination and united national support, can we expect, in the long range of the future, to avoid becoming victims of destructive forces of international anarchy which in the absence of organized international relations will rule the world. By the procedure of cooperation with other nations likewise intent upon security, we can and will remain masters of our own fate.” The packed House Chamber applauded the Secretary’s address.